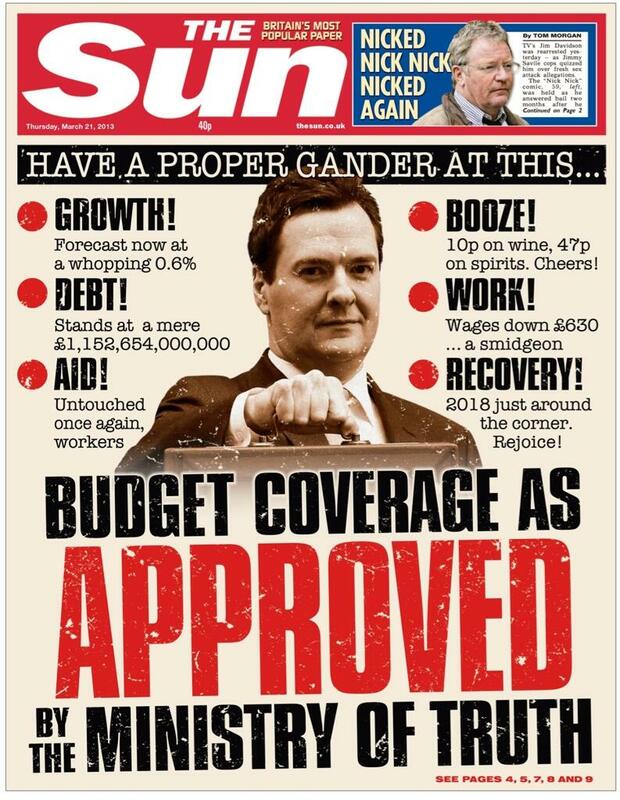 The Sun's Budget coverage is quite brilliant. 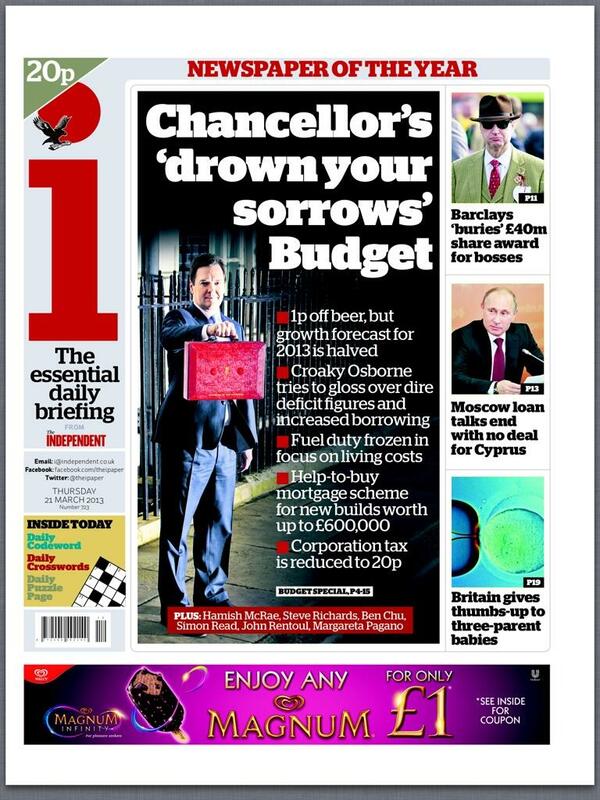 How to deliver a double whammy to the Government over the Budget and Press regulation with one waspish front page. 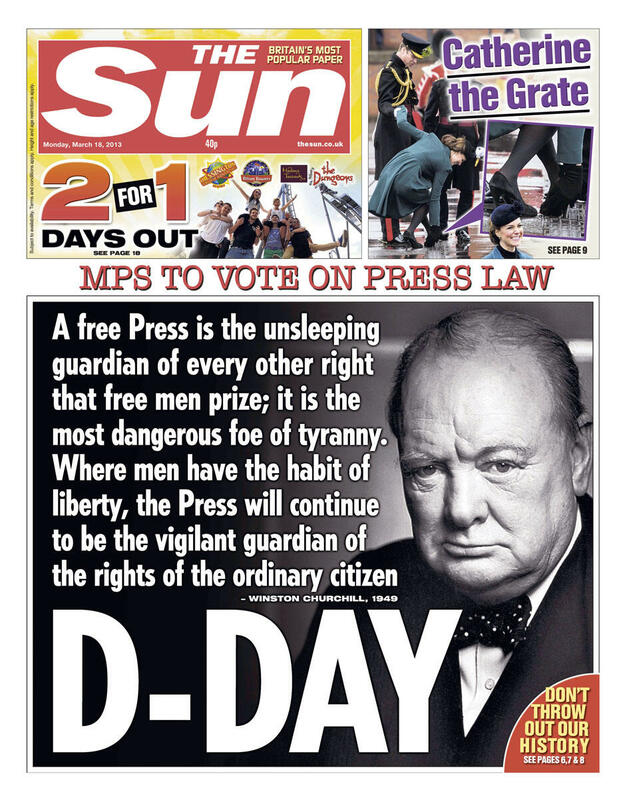 Note the 'proper gander' strapline. George Orwell would have approved. The Daily Mirror also takes a robust campaigning stance with a damning verdict of the Chancellor's Fudge-it Budget. 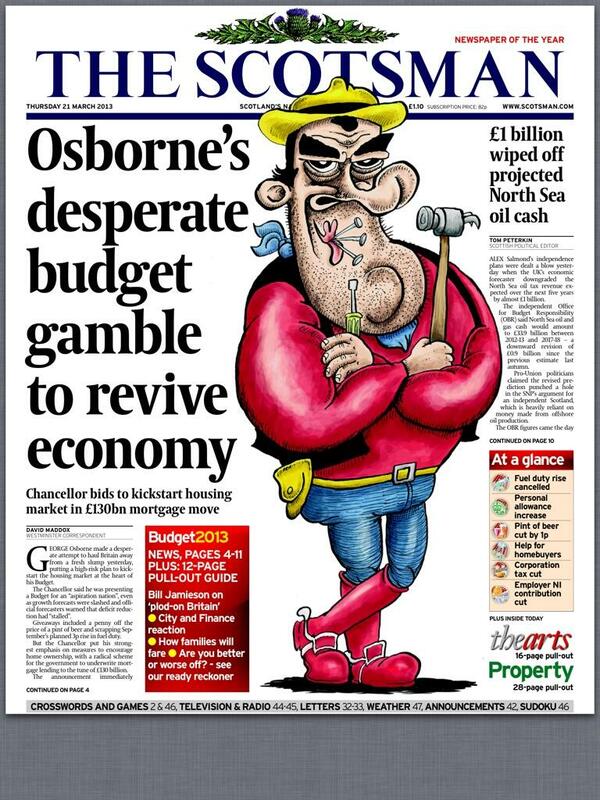 I love the contrast between the black and white urchins and a smug Osborne. 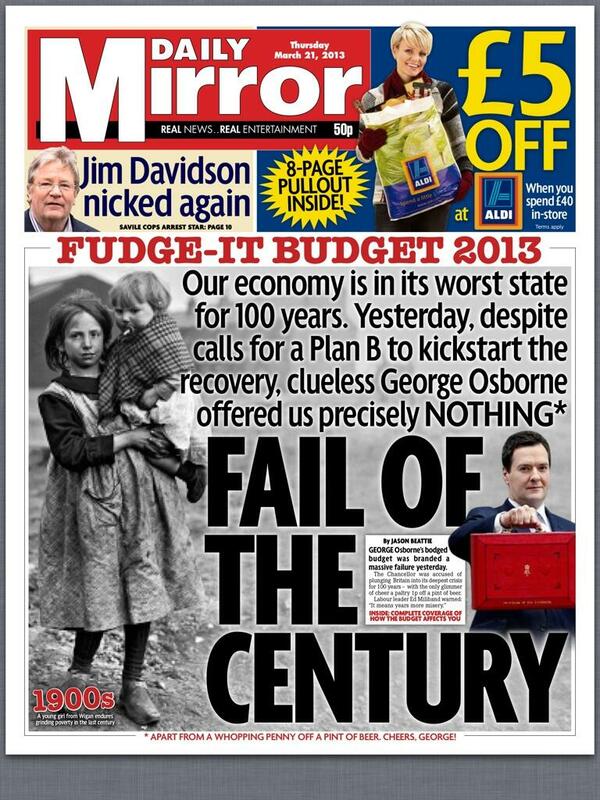 Another page that would have scored well with Orwell. 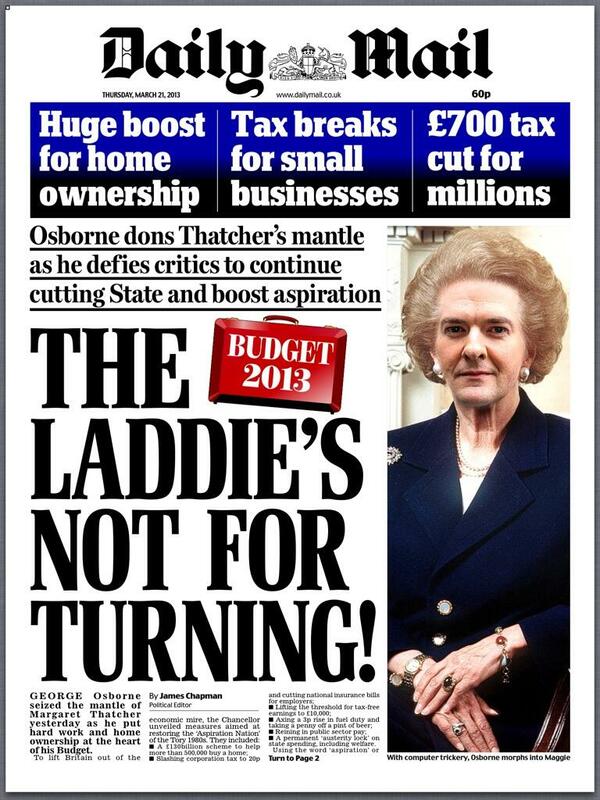 The most disturbing front page, though, is by the Mail. 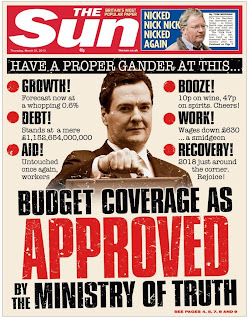 The paper may take a positive view of the Chancellor's measures - but it hasn't done him any favours by morphing him into a grotesque Thatcher hybrid. 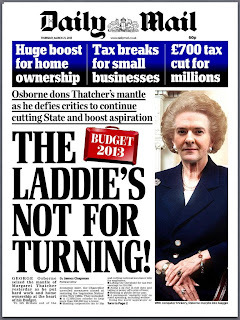 It's not just the gruesome image of Osborne's face with Thatcher's hair, but the grizzled hands that will keep me awake tonight. 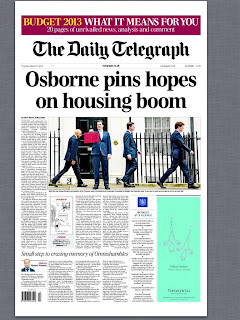 The Daily Telegraph may have the straightest headline of the day, but it has by far and away the best picture. As @SimonNRicketts commented on Twitter, it's the worst Abbey Road tribute ever. 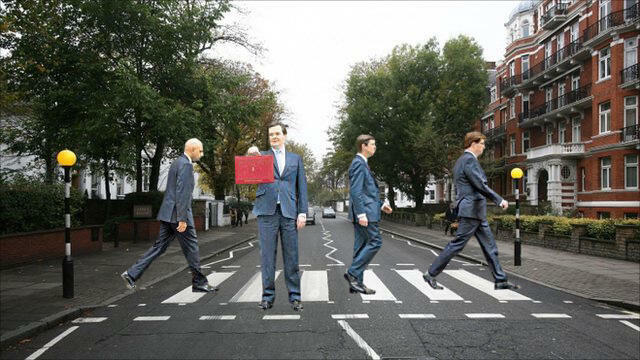 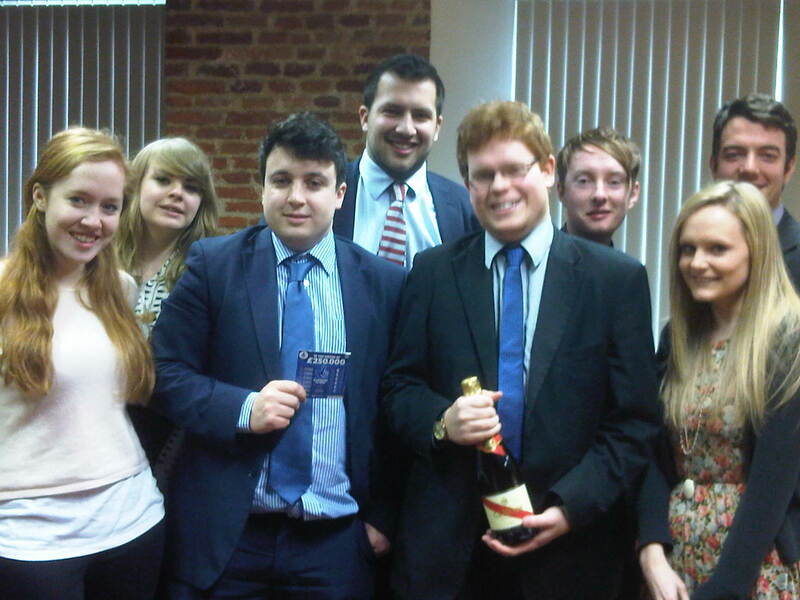 And within minutes David Stokes @scottywrotem had posted this. 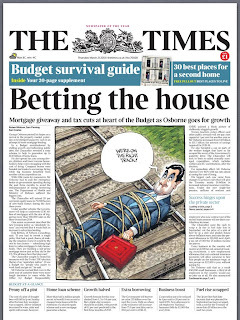 Great comic value on a day that didn't really offer much to make you smile. 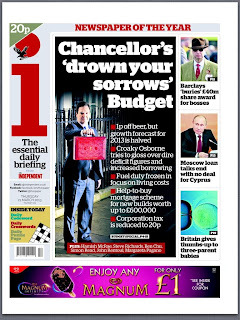 The Guardian also has a bold front. 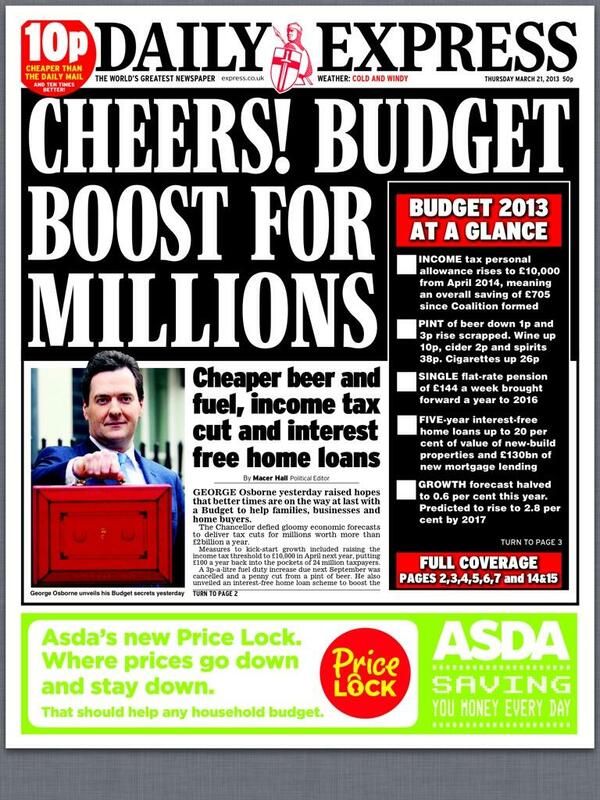 It uses a classic Budget day front page cartoon showing Osborne the slug struggling at the bottom of a beer jug. Nice. 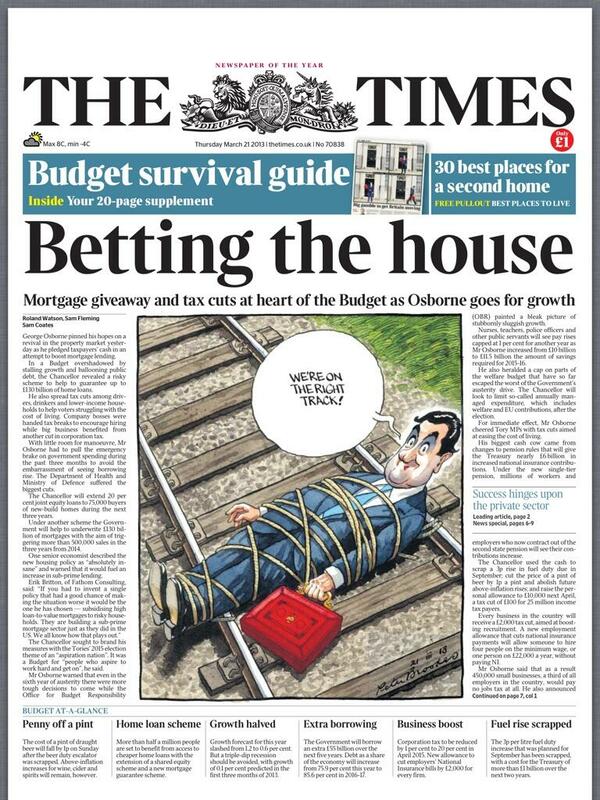 The Times also goes for a cartoon, by the brilliant Peter Brookes, with Osborne proclaiming 'We're on the right track' as he waits helplessly for his fate. 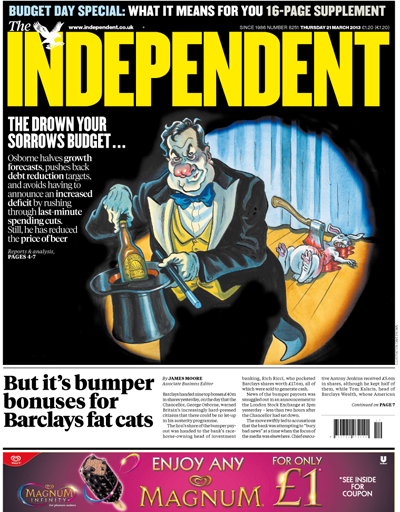 The Independent returns to its Watchmen theme that it used for the autumn statement. 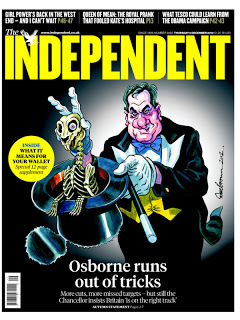 Then it had the Chancellor pulling a skeletal rabbit out of the hat. 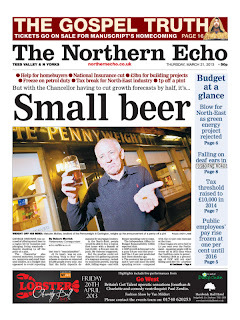 Now he has killed the rabbit and is reaching for the beer bottle. 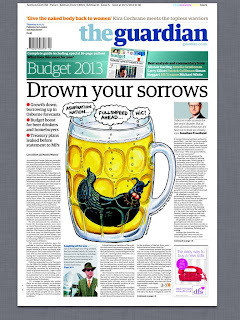 The drink theme - and the Drown your sorrows headline used in The Guardian - is accenuated by Osborne's bulbous red nose. 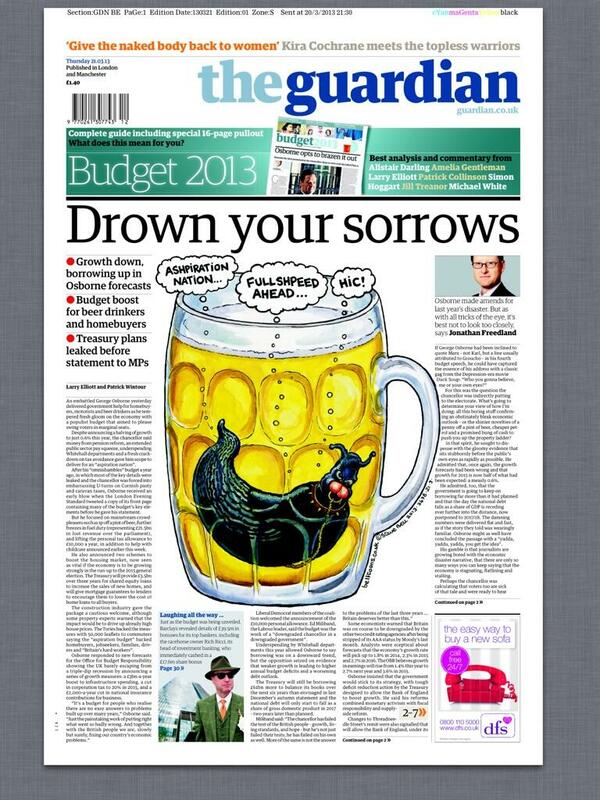 Drown your sorrows is also the line in i. 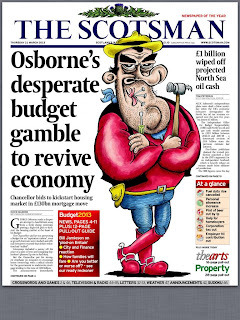 The Scotsman also chooses a cartoon for its front page illustration, portraying the Chancellor as Dandy character and well-known Scot, Desperate Dan. 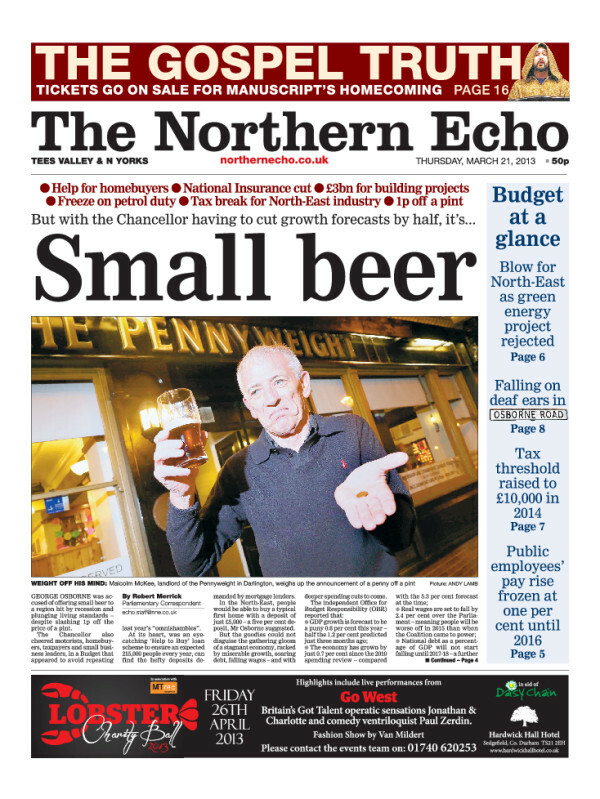 The Northern Echo is another paper taking to drink with its Small beer verdict. 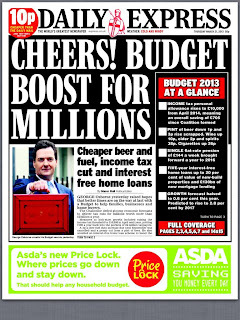 Meanwhile the Express decides the Budget is all good news for everyone and produces the most ordinary page on a day of otherwise extraordinary pages. 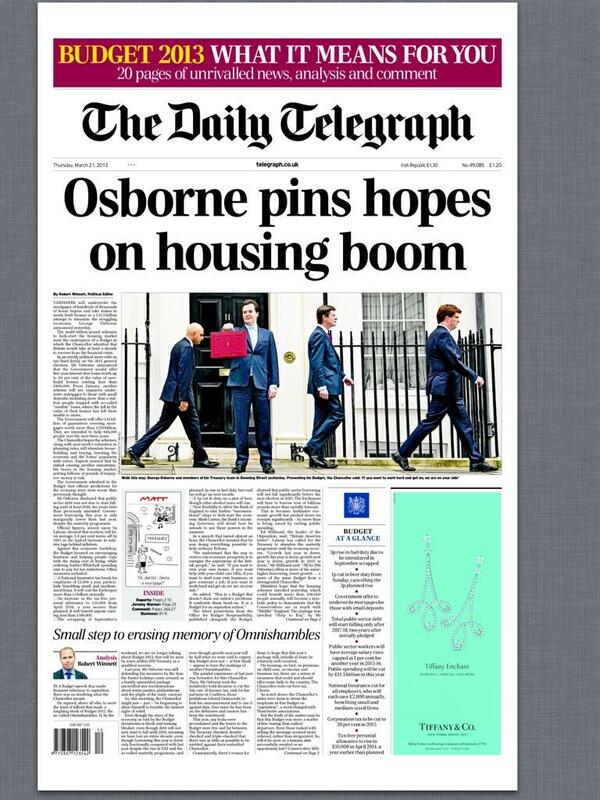 There are clearly some great papers around. Please make sure you buy at least one.